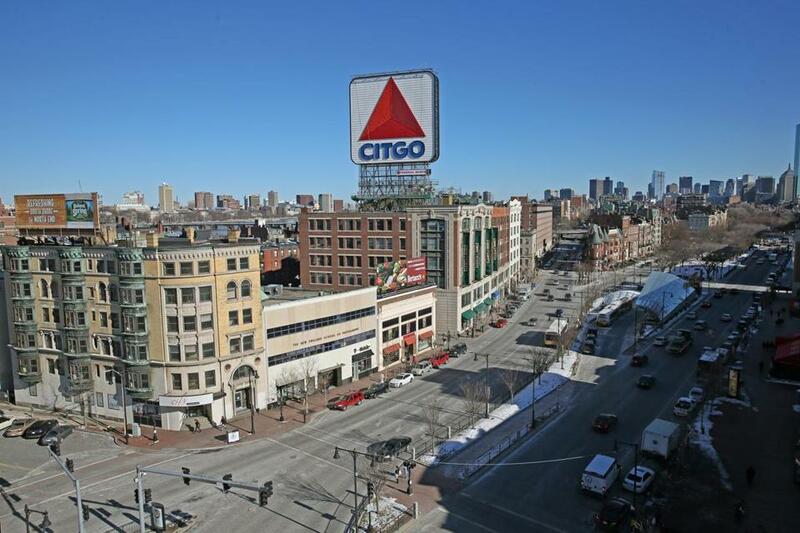 The iconic Citgo sign in Kenmore Square is for sale. A big chunk of a busy Boston neighborhood — and control of one of the city’s best-known landmarks — is on the market. Boston University said Thursday that it has hired a real estate firm to sell a block of buildings on the northern side of Kenmore Square along Commonwealth Avenue and Beacon Street, including one that carries the Citgo sign on its roof. The famous flashing sign, which has served as backdrop to Fenway Park home runs since 1965, is not itself for sale; it’s owned by a sign company that leases air rights atop 660 Beacon St . But the property sale raises questions about the sign’s future. It is not a protected landmark and BU said there are no conditions included in the terms of the sale, though a university official said he expected it would probably stay put. Putting the nine buildings up for sale is the final move in a decades-long plan by Boston University to spark redevelopment in the once-grungy square that serves as its front door, a bustling crossroads where it bought up much of the real estate in the 1970s. Since then, many of the businesses that gave Kenmore its old character have gone — the music clubs and dive bars, the IHOP and the Deli Haus, and, for that matter, the methadone clinic that brought hundreds of addicts to the neighborhood every day. Now there’s a spruced-up T station, destination restaurants such as Eastern Standard, and the block-length Hotel Commonwealth, which just underwent a swanky renovation — all on the southern side of Kenmore Square. The north side, home to BU’s Barnes & Noble campus bookstore and a hodgepodge of restaurants and storefronts with offices above, is less changed. BU — which would rather focus on education and research than redeveloping Kenmore Square — wants a new owner to finish the job, said Gary Nicksa, BU senior vice president for operations. 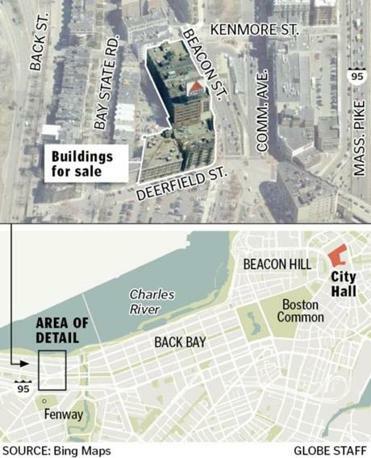 The school hired brokerage firm Newmark Grubb Knight Frank to shop the properties — nine buildings covering 1.5 acres wrapping from Deerfield Street around to Commonwealth Avenue, where it intersects with Beacon.Nicksa said he hopes to have a deal in place in a few months. Executives at Newmark did not return messages seeking comment Thursday. No estimated sales price was offered, though the properties could easily fetch tens of millions of dollars. The market for office buildings in Boston — including smaller, second-tier buildings such as these — has been strong of late. Just this week, Synergy Investments sold four smaller downtown buildings for $90 million, after buying them for a combined $56.2 million in 2012 and 2013. Rents on so-called Class B space have climbed 30 percent in a year, according to real estate firm Cushman & Wakefield. And the Hotel Commonwealth — right across Kenmore Square — just sold for $125 million. That hot market helped push BU to sell now, Nicksa said, after considering a sale several times in recent years. Plans for the buildings will ultimately be up to the new owner, though Nicksa said BU hopes to keep a voice in the redevelopment. Any large-scale project would need approval from the Boston Redevelopment Authority. Pam Beale, who has operated Cornwall’s Pub in Kenmore Square since the 1980s, said she hopes whoever buys the building she’s now in respects the unique character of the neighborhood. Part of that is Kenmore’s many small local businesses, said Beale, who serves as president of the Kenmore Association, a neighborhood business group. She had to move her bar 15 years ago to make way for the Hotel Commonwealth, and said BU helped. She said she hopes any new development makes similar efforts to preserve businesses such as hers. Then there’s the question of the Citgo sign, which looms over Kenmore Square and Fenway Park from atop 660 Beacon St. It would not technically be part of the sale. The sign is owned by a company that leases air rights from BU, Nicksa said. It will be up to a new owner to decide whether to extend that lease. That’s because, despite being one of Boston’s most recognizable landmarks, the sign is not an official city landmark — a status that could give it extra levels of protection from being torn down or moved. That prospect was raised in the early 1980s when Citgo tried to remove the sign. Preservationists persuaded the Landmarks Commission to delay demolition long enough that Citgo changed its mind and restored it instead. It was restored again in 2010. But efforts to have it declared a city landmark failed, and have never been revived. “There are no official protections in place for the sign,” said John Laadt, a Landmarks Commission spokesman. The state has no particular say in the matter either, said Brian McNiff, a spokesman for Secretary of State William F. Galvin, who oversees the Massachusetts Historical Commission — though Galvin’s office could review any development plan that involves public funds. Nor is it on the National Register of Historic Places. Still, Nicksa said, any change to the Citgo sign seems unlikely, if only because its presence makes the buildings beneath it, and the character of Kenmore Square, so much more valuable.